The architects conceived of this home as one that would be wrapped in soft light. They achieved this by inviting natural light into the home through large windows and then creating a large white interior with various levels and ceiling heights with unusual curves. The white walls bounce the light around the space and give it an even, diffuse quality. 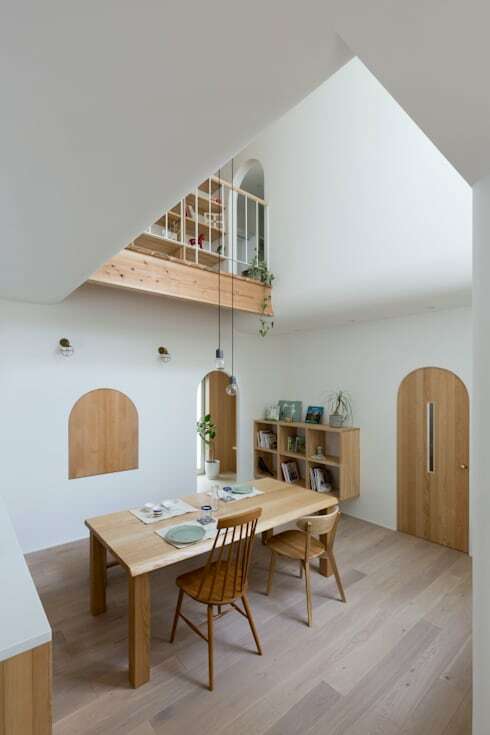 The all-white colour scheme has been balanced by the profuse amount of wood in the home. The ceiling has wooden beams, windows have a wood trim and the simple wooden chairs could be retro Scandinavian pieces. Also, take note of the platform floor in the living room. This is a typically Japanese feature. The home has an extremely private exterior. 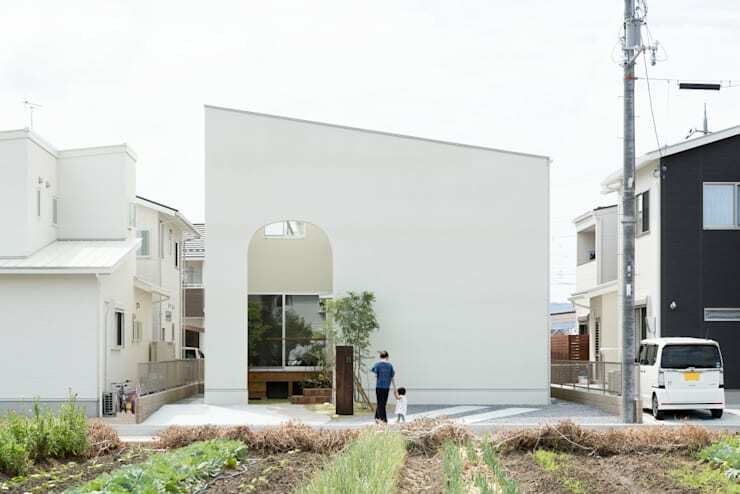 This white wall serves as a sort of shell for the main structure and forms the walls of a private front courtyard or garden. The entrance has been designed with double height and this serves to make the rather private home feel welcoming. Our favourite features in this home are the curved doors and windows. 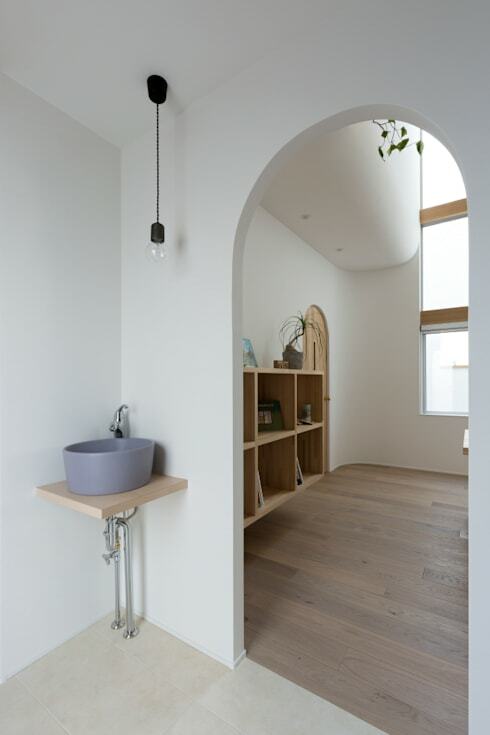 We love how this element has been further reflected in the gentle curve of the ceiling opening. This, together with the mismatching wooden furnishings, makes the home feel like something out of a fairy tale. Of course, this would not happen without the utter simplicity of the decor. The dining area is illuminated by a couple of simple bare light-globes and there are just a few small houseplants for decoration. The Scandinavian-style kitchen is composed of a very simple long white bench with open wooden shelving and a large kitchen island. 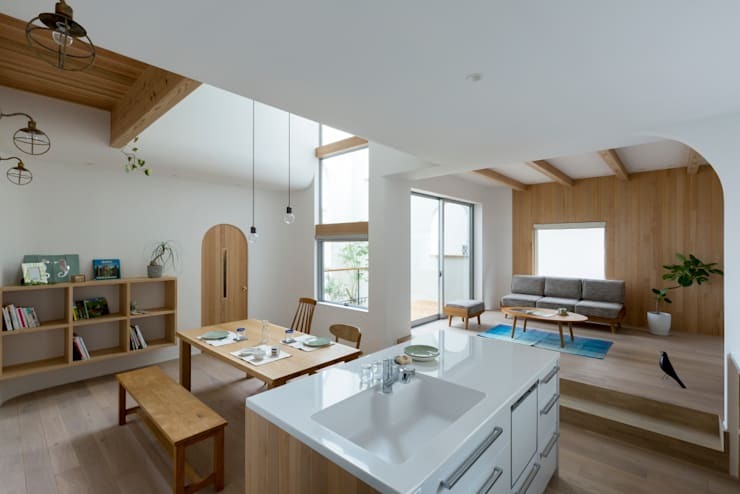 Wooden materials and white walls are always a good combination, and here we have a good example of how these two materials can be used to integrate a kitchen into a living room decor. See how there are no wall cupboards and the space has been kept humble, open and simple. 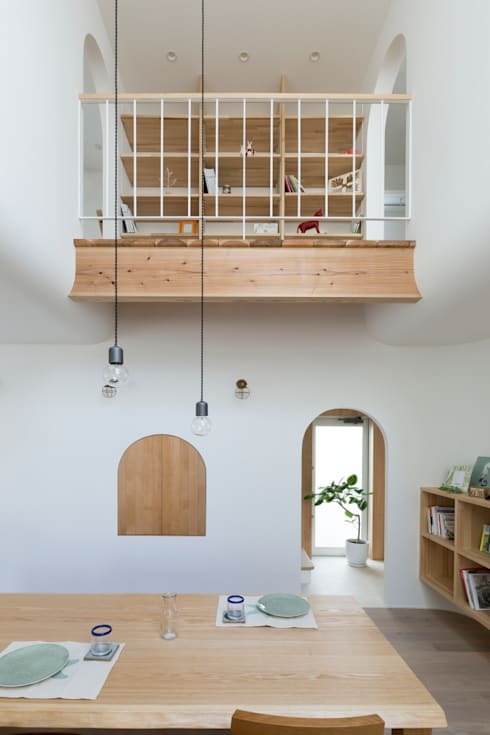 The home needs few decorations because it's replete in beautiful architectural features such as the little wooden mezzanine. The mezzanine has a thick and chunky wooden lower panel that fits snugly between two curved walls. It also has a fine, white barrier and thin wooden rail. This creates a nice contrast between the two parts and serves to accentuate the fairy tale quality of the home. The upper level walkway also has a series of open bookshelves that further highlights the simple symmetry of the space. While exploring this home, we've noticed that there are few signs of modern accessories. The extreme simplicity is continued in the bathroom where the bathroom sink is just mounted on the wall and whittled down to an extremely modest size. Looking out from the bathroom, we also have one final view of the curved open doorway and the unusual curve of the living room ceiling. For something a little different, check out A small apartment beautifully modernised. 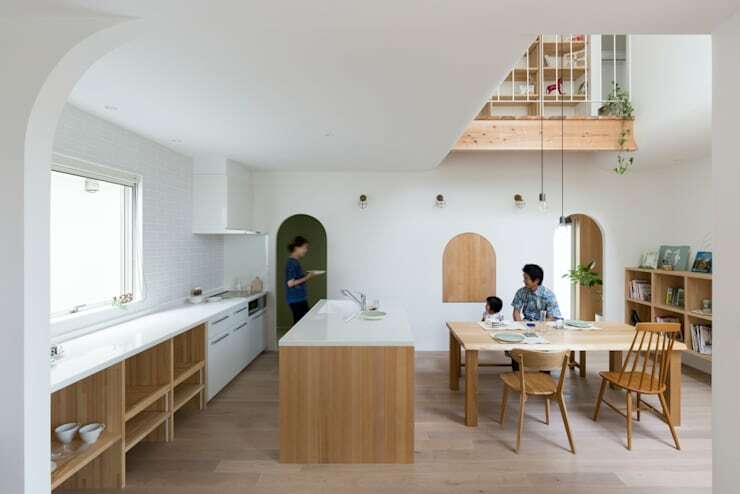 What do you think of the cosy ambience in this Japanese home? Let us know in the comments field below!